Baroque – a period between 16th and 18th century that became closely associated with excellence in art, architecture and culture. It is a phase that gave birth to such masterful works of art as painted by the Carracci brothers, Pietro da Cortona, Caravaggio, Peter Paul Rubens and Francisco de Zurbaran; sculpture and architecture as created by Gian Lorenzo Bernini and Francesco Borromini; music as composed by Antonio Vivaldi and Johann Sebastian Bach. In all its forms art came to exhibit a pronounced preference for expressiveness, intricate details, a sense of high drama, depth of light and shadow. 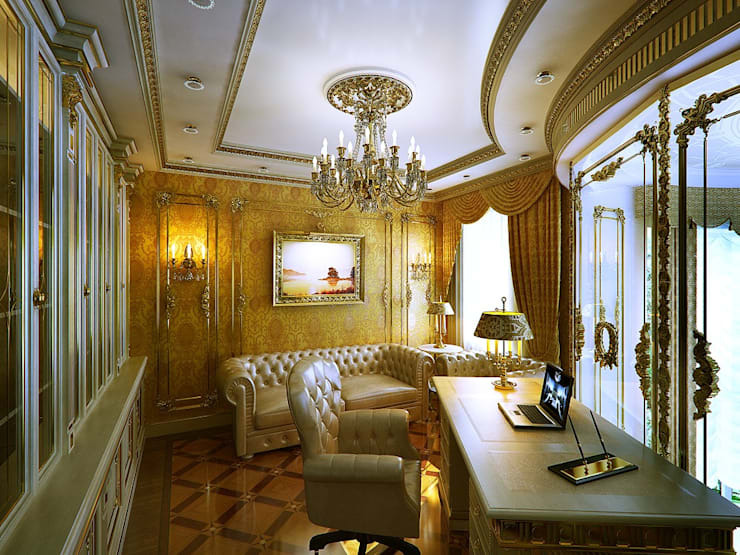 In modern time, to decorate a home in baroque style would be an act of fine balance, because you will need to showcase a fondness for lavish decorations sans any creeping sense of tackiness. Also, baroque interior in modern era is no longer pure baroque, but a union of many different artistic ideals like that of neoclassicism and, even, nouveau. A harmonious blend of various classical styles will also produce stellar results if you remember Giuseppe Mazzini’s words, “Art does not imitate, but interpret.” On that note let us begin decorating our home in baroque style. Villa in Switzerland Chemin De Bonnevaux. Your home should be steeped in such colours that it resonates with the essence of baroque. An opulent colour palette is that which you hold close to your heart, seems not to oppress you and makes your home look elegant. It really does not matter whether you prefer a more soothing colour scheme or darker tones, but how you incorporate those in the interiors of your home. Remember some of the greatest works of architecture and interior décor like St Peter’s and twin churches at Piazza del Popolo, Rome, Ca’ Zenobio and Palazzo Priuli Stazio in Venice were the products of this time. A small apartment may also have the opulence of baroque, if you do not clutter it with too many objects in too varied a shade. Historic architecture and sculpture of note often used to receive liberal amounts of gold, silver and bronze gild. Baroque period was no exception in this regard. Behind the austere façade of St John’s Co-Cathedral in Malta lies one of the most ornately decorated golden interior. Santa Maria della Vittoria’s Saint Teresa, sculpted by Bernini, receives most generous blessings of golden sunrays. Irrespective of its religious or non religious nature, eastern art and architecture showcase even greater fondness for gold. Golden colour signifies knowledge. It is also considered a harbinger of prosperity. Introduce gold tone in your décor. Depending upon the suitability use gold tone ceiling decorations, lamp shades, furniture, rugs and furnishings in your baroque home. Choose intricately designed traditional furniture for your home. Let it match the existing colour scheme by modifying its upholstery. Use dark high quality wood to create these types of pieces. Alternatively, you may visit auction sites and shops dealing with antique furniture. 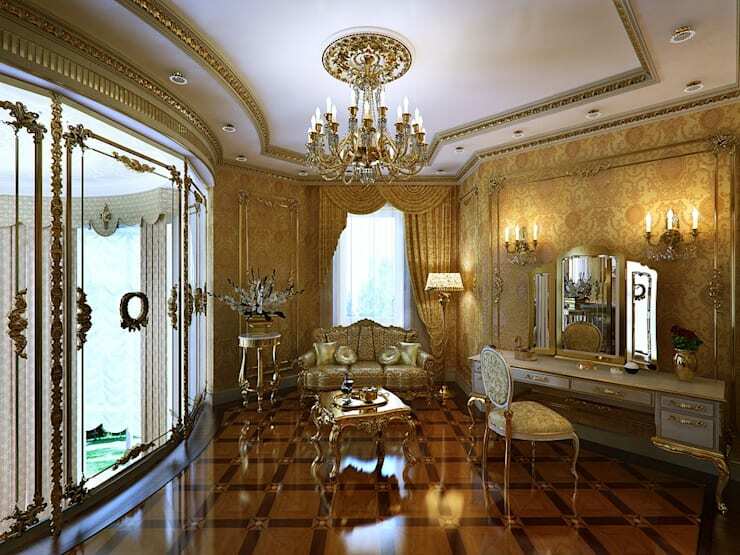 From the hallway to the dressing room, do not let any part of the house be untouched by the glamour of baroque. This dressing room uses a combination of very ornately decorated gold tone walls, floor, curtain and furniture to create a powerful impact. Instead of soaking your walls in baroque themed colours, think of using highly detailed wallpapers. Combine them with neutral tones for your interior. 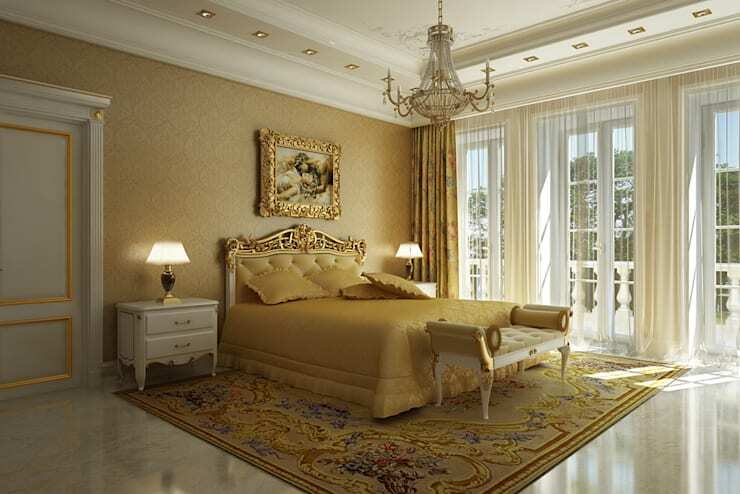 Go for subtle geometric motifs or golden floral motifs like this home decorated by Design Studio of Stanislav Orechov. The choice largely depends on the overall colour scheme, your personal tastes and the size of your rooms. Remember, your aim is to impress and not to overwhelm anyone with the plush interior of your house. Exquisite hand painted wallpapers in antiqued paper or silk will have a more compelling effect than the regular machine printed ones. Also, do not ignore the necessity of classical art works in a baroque home. 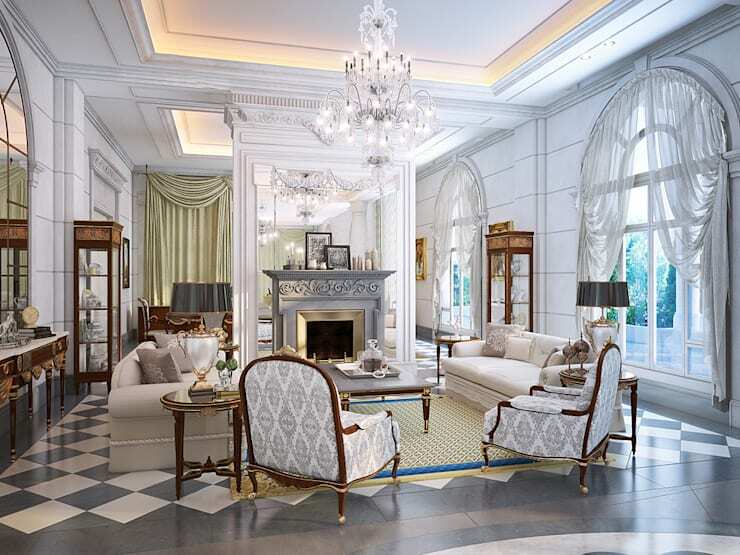 A baroque home will not tolerate the absence of luxury wood, bronze or crystal chandeliers. Preferably, these should be installed in every room but specifically in the living and dining rooms. If your home is built in classical style with high ceilings, you have the liberty of opting for more elaborately designed chandeliers. For this too, you may visit local antique dealers or auctioneers. You will also find baroque chandeliers on sale in such places as Murano, Liguria and other prominent cities around the world. Of course, candles are now replaced with modern fixtures. But this apart, stay away from the cheap ones made of synthetic materials. 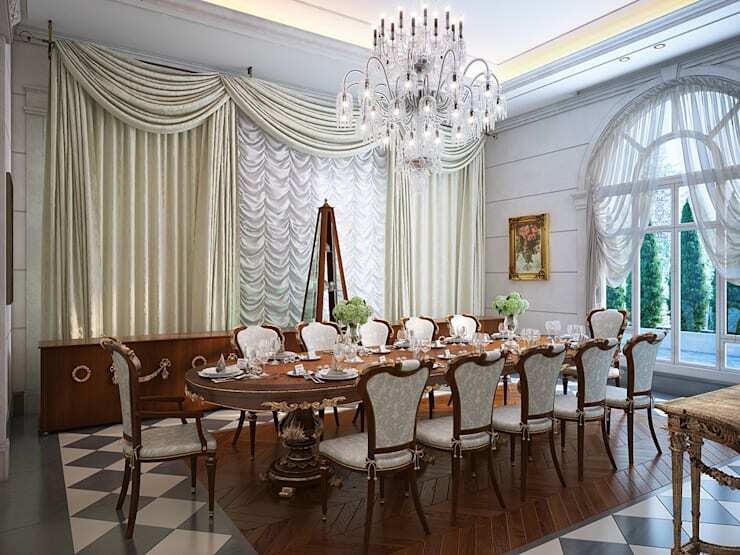 Instead of illuminating the interiors, they will give your baroque home a shabby feel. While caring for the walls, do not dismiss the look of your ceilings. If you are giving your walls an extravagant finish then do not go overboard with the choice of décor for your ceilings. Intricate but monochromatic stucco patterns and delicate motifs will help to decorate the ceilings in a subtler and more tasteful ways. On the other hand, if the walls wear a less ornate design you can be more adventurous with your ceilings. Decorating it with frescoes based on your chosen mythological tale or classical literature will be an excellent idea. 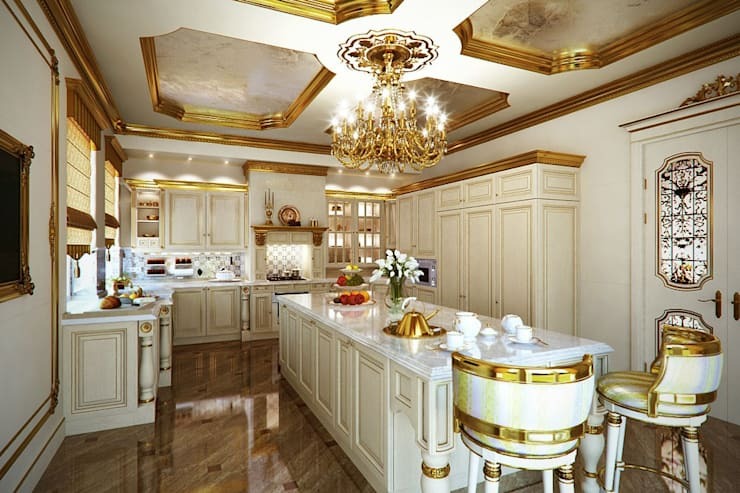 This kitchen uses fine cloud pattern with golden borders on the ceiling to decorate its modish interior. This gives it a gorgeous baroque look in spite of its modern structure and amenities. While giving your home such a magnificent makeover, do not ignore planning for your bathroom. 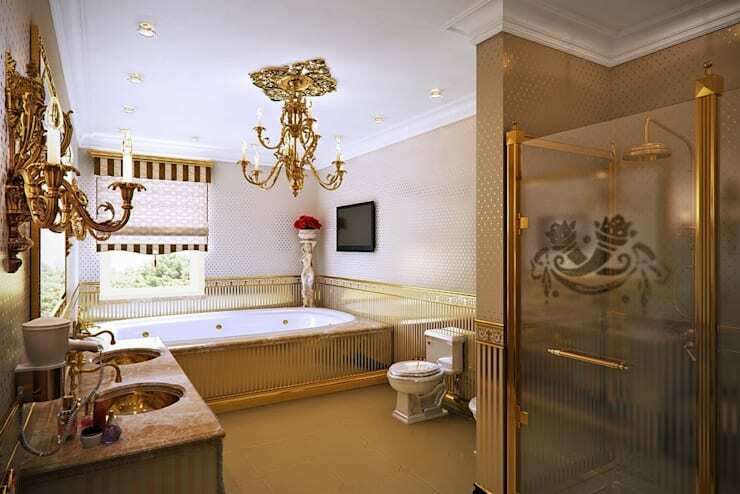 Gold tone bath fittings with antiqued sanitary wares will give it a suitable baroque look. Arrange for a large and beautifully framed mirror and basins showcasing the grandeur of the past. Let the other parts of your bathroom including the vanity units, bathtub and curtains ooze the same elegant feeling. You can consider decorating the ceiling with small but intricate motifs and frescoes. Keep it graceful and in tune with the rest of the house and you will have the most comfortable baroque home for yourself and your family. If you want to know that how could you transform your home in a few basic steps, then have a look at article here.